This is a new feature of the site, where I will discover new places to buy Macs, iPods and (maybe after a long time) iPhones! 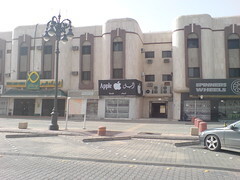 First is this under-construction store simply named “Apple Riyadh” pictured on the right. Its located on tahliah street. You can find it on Google maps. Another store is iTechia. Also on tahliah street. I bought my Macbook pro from them 2 months ago. They offer a huge collection of Apple products and accessories. Worth visiting. Google Maps link. This is a great website, you should translate it in Arabic language and promote it more. It would also be great to have a directory of all distributors network in KSA. There is a store called Technology Bridge (TB) at Olaya Gulf Commercial Center just near the Olaya computer market situated on King Fahad service road. They also have a technician to help in installation and maintenance repairs. Why are all products in Saudi much more expensive than elsewhere. There margins must be 3 times other countries. Do a comparison between european/us/Asian stores and you’ll find how much we in Riyadh (Maybe Saudi) are being overcharges. All of these products are made in China/Asia which is very close. The problem is, Apple (like many other companies, Sony for example). Consider the Middle East part of their European distribution. i dont know the cost of iphone battery can any body help me? i want to purchase an ipad wifi+3G 64GB..how much the price now in your store and is it still available there? and eject sells them I think for a cheap price? Check them out! can i find apple productions in mecca? is there any shop or any place near to kaabe? 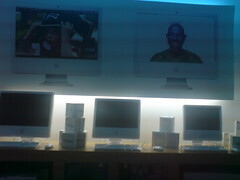 i want a job in apple store in riyadh.i am a mobile repairer. i wanna find an apple store in Riyadh i need to fix ma macbook pro can anyone pls tell me where can i find?